Pittsburgh is becoming a new home for Ixil survivors of the Guatemalan civil war and their children. “There are a lot of us here,” said Juan Carlos, a 23-year-old Ixil man who lives in East Liberty. Carlos came to Pittsburgh four years ago and works in construction. Before coming to Pittsburgh, he was living in Centreville, Virginia, one of only two recognized hubs in the United States for Ixil immigrants from Guatemala. The second is in Dover, Ohio, only two hours from Pittsburgh. Now, Pittsburgh seems on its way to becoming a third Ixil hub. Ixil immigrants come from the Guatemalan department of El Quiché, in an area known as the Ixil Triangle. In that region, there are three cities: Santa Maria Nebaj, San Juan Cotzal and San Gaspar Chajul. Many of the Ixil immigrants who I have met over the past few years as a former service coordinator for Casa San Jose have been young adult men and teenagers from Nebaj. Casa San Jose is a Pittsburgh-based advocacy and social service organization for Latino families, and we have helped many members of the Ixil community settle in the area. I’ve also come to know a number of other Ixil immigrants in and around various East End neighborhoods: East Liberty, Garfield, Highland Park and Friendship. I’ve met them at a bodega on North Negley Avenue that sells international calling cards and offers services that enable them to send money back home; as employees or sometimes fellow customers at Patron Mexican Grill in East Liberty; and on the sidewalks of Penn Avenue in Garfield. Despite being in some ‘up-and-coming’ neighborhoods, I’ve seen many of the apartments they’re inhabiting and they are not living in luxury. Some have rodents and mold and other units that are suitable for four people are holding twice that. 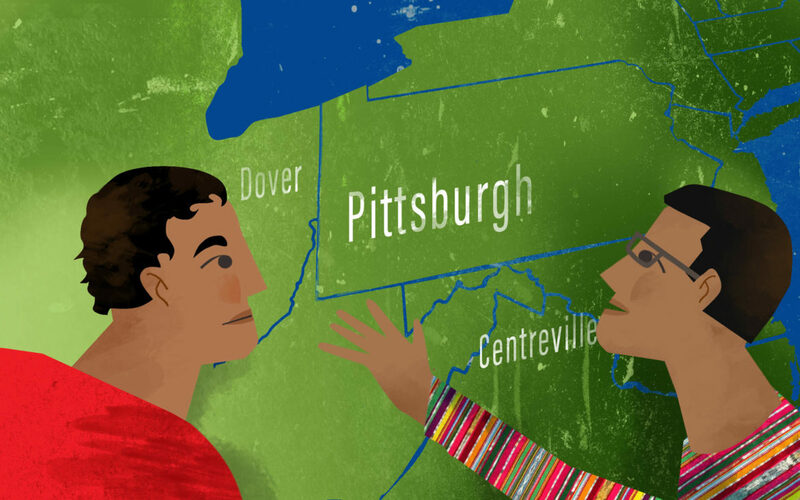 It’s hard to say when Pittsburgh started to become a known destination for Guatemalan immigrants. The Latino community in Allegheny County has been growing for some time but remains relatively small. The community grew by more than 70 percent between 2000 and 2010, according to U.S. Census figures. Between 2010 and 2015, the community continued to grow by 28 percent. While census data is notorious for undercounting minority and immigrant communities, it indicates modest growth. The census does not break down the Latino population by country of origin, but other local sources help paint a more detailed picture of where these newer immigrants are from. Casa San Jose is one of six agencies included in Allegheny County’s Immigrant Services and Connections [ISAC] program. According to Casa Director Monica Ruiz, Guatemalans (both Ixil and non-Ixil) are the second-largest group of Spanish-speaking clients served by the six agencies. Mexicans are the largest. ISAC also keeps statistics on the most common languages spoken by the Latino population. Behind Spanish, one of the most common is Ixil , a Mayan language. Ixil (pronounced ee-sheel) is spoken by Guatemalans of indigenous, Mayan descent. This history of the Ixil people is heart-wrenching. During a part of the Guatemalan civil war, former military dictator José Efraín Ríos Montt ruled Guatemala. Montt lead a movement to defeat a guerrilla movement in the countryside, including violence against the Ixil people. More than 70 percent of Ixil villages were destroyed between 1981 and 1983, according to the Guatemalan Human Rights Commission. An estimated 5.5 percent of the Ixil population was killed. Diego is one of the first Ixil immigrants that I encountered while working at Casa San Jose. He came to the United States in 2014 when he was 16. He arrived alone and undocumented during a historic wave of arrivals of unaccompanied minors from Central America. Diego is from an aldea, or small neighborhood, near Nebaj. He left Guatemala for the same reasons that many young immigrants have cited: extreme poverty, lack of work opportunities and violence largely perpetrated by the street gangs Mara Salvatrucha (MS-13) and Barrio 18. Diego lived in Pittsburgh’s Beechview neighborhood with his uncle, Francisco, for a year and briefly attended Brashear High School. His father, Nicolas, was living outside of the city when Diego arrived. He was unable to have his son live with him because he had been deported by U.S. Immigration and Customs Enforcement [ICE] in the past. ICE caught him shortly after he crossed the border and sent him back to Guatemala. Almost immediately, Nicolas crossed the border again and made it into the United States successfully. Francisco had never been taken into custody by ICE or the U.S. Border Patrol and was allowed to be Diego’s guardian. Early in 2015, while Diego was in Beechview, ICE arrested three of his adult roommates, including his older cousin, Manuel. One was released and the other two, including Manuel, were deported. Roughly two years after being deported, Manuel was murdered in Nebaj. Francisco was not home and, therefore, not taken during the raid, but he voluntarily returned to Guatemala about a year later. A few days after ICE took the men from Diego’s apartment, Diego left Pittsburgh and went on the run. Nobody in Pittsburgh seemed to know where he was. A couple weeks after Diego left, another roommate Bernardo told me he had heard from one of Diego’s school friends that he had talked about going to Texas. A few weeks later we talked on the phone and he filled me on his life. He said he had recently returned from Texas and was now living in the west suburbs of Pittsburgh, working at a Chinese restaurant as a fry cook. “I have friends from Guatemala in Texas,” Diego said. “I paid a coyote (smuggler) $800 to get me from Pittsburgh to Texas. Diego used money he had saved up from cleaning movie theaters alongside his uncle and cousin in Pittsburgh to pay for his trip to Texas. Diego spent a year in Texas working cutting grass. He now most likely has an order for deportation because he missed court. I asked Diego how he felt about the possibility of being deported and what he envisioned for his future if he were sent back to Guatemala. He said he’d be afraid he’d be robbed or hurt by members of Mara Salvatrucha [MS-13] or thieves. He explained that when Guatemalans arrive in the United States and start working, they send a lot of their income back to Guatemala. The gangs keep track of who has relatives living in the United States and extort the remaining family members in Guatemala. Diego also said that MS-13 will target recent deportees when they return to Guatemala. Pittsburgh in a nondescript Chinese restaurant, straining spring rolls and crab rangoons from scorching oil, is a good one. I was entertaining a guest in my home in the winter of 2017 when I received a call from a number I didn’t recognize on my cell phone. I silenced the call. Moments later, my phone buzzed again. Same number. Once more, I sent the call to voicemail. No more than a minute later, my phone rang yet again. I answered the phone in Spanish. I just had a feeling. When I was working at Casa San Jose, my co-workers and I joked about “the Latino call” — when the same person would call as many times in a row as needed until the person on the other end picked up. The man on the other end of the call was Santiago, now 28, an Ixil from Nebaj who is also undocumented. He said he needed help locating his friend, another young Ixil immigrant. His friend had left for work in the morning the previous day and never returned. Santiago told me he lived outside of Pittsburgh and didn’t have transportation. He couldn’t get to Casa San Jose or any other organization that might be able to help locate his missing friend. I was no longer working with Casa San Jose but was still in contact with the organization. After about a week and what seemed like an endless stream of phone calls between Casa, Santiago and me, we learned that the friend had been picked up by ICE and was in a detention center in Ohio. Santiago lives in a quaint, almost furniture-less home in Butler County with a handful of other immigrants from Guatemala, Mexico and China. The house is owned by their employers at a Chinese restaurant. Santiago had his own room, which contained a refrigerator, a chair, a collection of baseball hats and a large stuffed teddy bear. “I came to the United States five years ago to work and send money back to my family,” he said. “Every time I get paid, I send them a part of my check.” Santiago said he takes home about $1,500 a month for working 40 hours or more a week. He sends anywhere from $50 to the entire check to his family in Nebaj, depending on their needs. Though he seemed happy enough with his living conditions, Santiago spoke of feeling lonely and isolated. His area didn’t seem to have an established Latino community, Latino stores or restaurants. When I went to leave, he asked me if I would drive him to the gas station a few miles down the road. He wanted cigarettes. When we arrived, he put the money in my hand and asked me to buy him a pack of Marlboro Reds. “This cashier is racist and won’t sell me cigarettes,” Santiago said. Santiago has a valid passport that can be used to verify his age, leaving no reason to deny him cigarettes. He waited outside while I purchased the cigarettes. I offered to ride him back up the road before I headed back to the city but he said he wanted to walk. I gave him a hug and we parted ways. Not long after that day, I received a distressed phone call from him. He said a coworker had hurt him in a confrontation. Santiago faced a dilemma that day: stay quiet or advocate for himself at the risk of being taken into custody and deported. When I last spoke to Santiago in early October, he said he was tired of his job and wanted to find a new one in the city. He wants to be less isolated, to learn English and find a clinic where he can get glasses. Making undocumented and indigenous immigrants like Santiago feel more welcome and less isolated is both a systemic and personal task. Social service and advocacy organizations like Casa San Jose that work exclusively with the Latino community play an invaluable role in lives of immigrant families and provide them with an unparalleled sense of belonging. 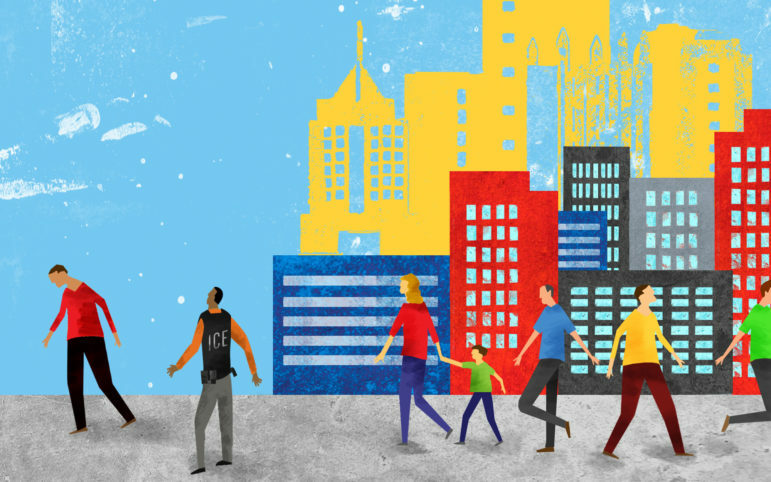 In recent years, local governments, including city and county planning departments, have also begun to play a pivotal role in developing program and policy initiatives for welcoming immigrants. In 2012, Dayton, Ohio, became the first city to create and pass a plan dedicated to making their city more livable for immigrants. The Welcome Dayton Plan is a consensus of the goals and recommendations of more than 100 individuals and representatives of a wide array of immigrant, public and private groups who came together to discuss how to engage new residents in revitalizing neighborhoods, building population and strengthening the city’s economic base. The City of Pittsburgh followed in Dayton’s footsteps when Mayor William Peduto launched Welcoming Pittsburgh, an immigrant and Latino immigration strategy in 2014. I was a member of the original Welcoming Pittsburgh planning committee. In 2015, the city released the Welcoming Pittsburgh Plan, which included nearly 40 community-led recommendations to advance welcoming efforts. The mayor’s office continues to lead implementation of the plan through partnerships. She wrote that the plan is a multi-year process, and she believes the creation of a municipal ID program and a local office of immigrant affairs could reduce systemic barriers for immigrants. In addition to making government offices and public institutions more welcoming and accessible to Latino immigrants through formal plans and assistance, there are simple, personal gestures that we can individually extend toward immigrants like Diego and Santiago to make them feel more accepted and less invisible. Ruiz shared a recent experience in downtown Pittsburgh that illustrated to her how far the community has to go in terms of extending even a casual welcome to the Latino community. Joanna Bernstein is a writer in Pittsburgh. She can be reached at joannaruth.bernstein@gmail.com. Francisco's 23-year-old son had gone out the night before and never returned home. The following day, Francisco's neighbor came knocking on his door to inform him that Manuel had been killed and his body was laying on the side of a road nearby. Changes to federal immigration policy under the Trump administration have prompted one of three Pittsburgh-area nonprofits that provide refugee resettlement to end those services. The federal government announced in September that the United States in fiscal year 2019 will accept only 30,000 people fleeing persecution — the lowest level since the creation of the U.S. Refugee Act in 1980. The reduced cap this year and for next year translates into fewer refugees entering te region and a decline in funding, which contributed to the Sharpsburg-based Northern Area Multi-Services Agency [NAMS] deciding to shutter its refugee resettlement services. I, too, was a child separated from my mother by the broken U.S. immigration system. We — the children of parents who at one point made the difficult decision to leave our home countries due to crime, poverty and abuse — are humans and we have a voice.